The second part of my road trip has passed by on more familiar terms. I am back in south-west Montana, in my favorite stomping grounds. My plans to spend a long time backpacking in the farthest reaches of the Lee Metcalf Wilderness have failed, because of the unplanned snow still clinging to the high country. In fact, even much of the low-foothills on north facing slopes are still covered in snow. Its pretty annoying considering the snow is too sloppy and wet to snow-shoe in, but still too deep to walk in. None-the-less, my days have been shared between mornings at coffee shops dong my various writing and emailing, and then the middle of the day spent on long trail runs in the Bridgers, where the snow isn’t so bad. In the evenings, I have spend some time creatively trying to strategies the best way to clean my body… usually mountain streams on trailheads or country turnouts. It takes a lot of resilience to clean your whole body in icey mountain water. But I usually get the job done. A clean body helps drastically with moral, as Ive found. I did manage to- stubbornly- dive as far into the Lee Metcalf as I could the last few day. I didn’t make it far, only a few miles. 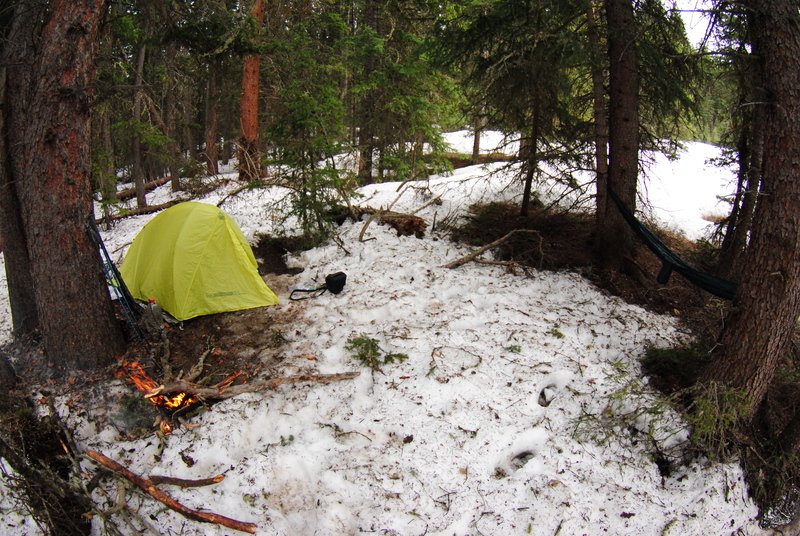 But I made a refuge in the snowy timber, and then spent days scouting the snow-free hillsides. I usually never sleep in a tent- but I decided to treat myself to an ultralight shelter. Its nice not having to worry about being exposed to the elements, as I usually have been in the past. I even brought a small hammock and hanged it in my cozy encampment. Some interesting events took place within the last few days of solitude there. Firstly, it became evident quite early that I wasn’t in complete solitude. 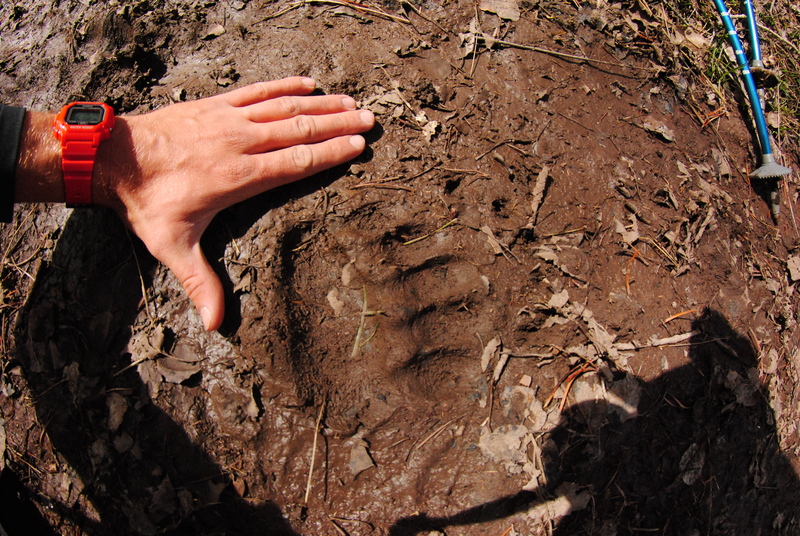 I began to find large Grizzly bear dig sites on the hillsides, and meadows around me. Also, the presence of a sow and cub Grizzly bear became known, after I found their tracks nearly every where I went, in the mud and snow. 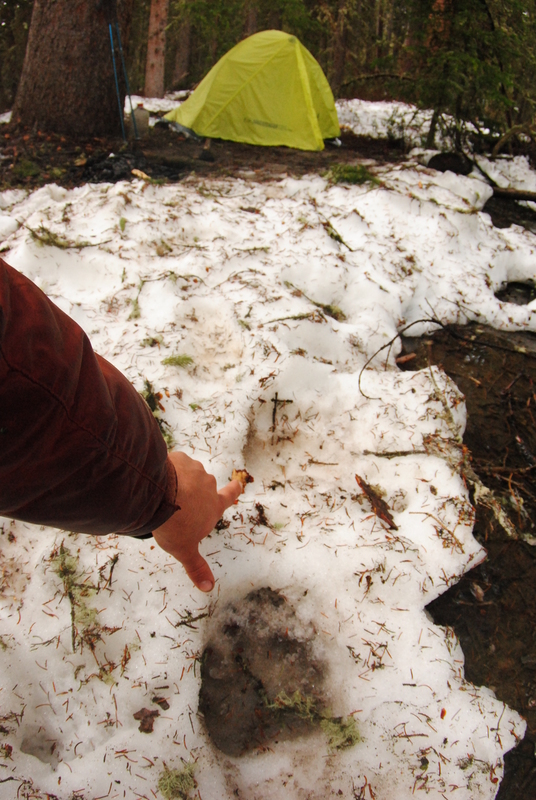 I did not find a single sign of black bear, reasoning that it was still too snowy for them to come out in the area. The Grizzlies atleast could dig down for the food, even if it hadn’t sprouted on the surface of the greenery. So I built my camp far in the timber, away from any possible place to run into a Grizzly bear by mistake. I also put my food a hundred yards away from me in an area where the prevailing wind blew the scent away from the open meadows, where I knew the bears would be hanging out. Well, the night before last, the wind changed, and blew uphill. I have often times imagined the scenario that took place, but had never ever experienced anything like it; besides once in Africa with a Hyena… but that’s another story. Well, sometime in the dead of my slumber, in the middle of the night, I was suddenly standing up in my tent with my heart thumping into my throat. 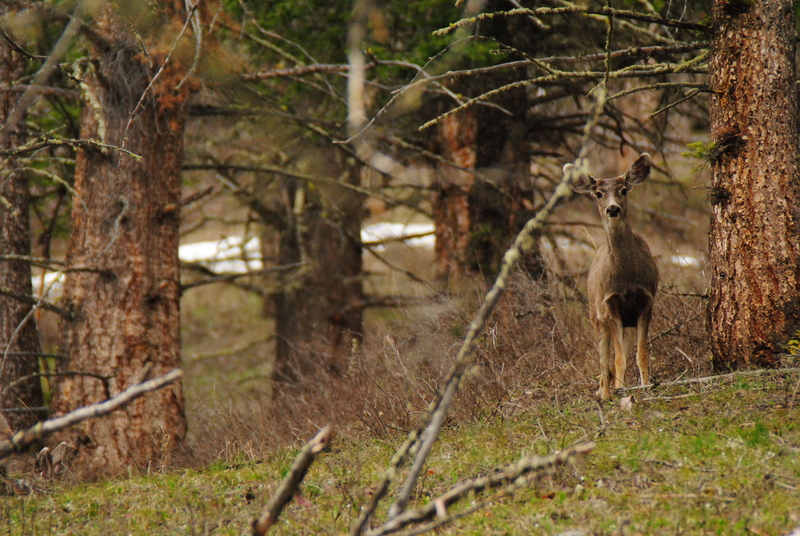 I then became aware of a large animal approaching me swiftly, and breathing deeply. I grabbed my revolver which lay by my head and gripped it with quivering hands. When I thought the animal was too close, I finally worked up the courage to shout, “Heyyy! Heyyy!” I was immediately met with a response from the mystery intruder; a deep, grunt like growl, “GRRHHHHH.” The animal turned and bounded away immediately. I went back to sleep, too exhausted to worry any more. In the morning, my adrenaline once again soared when I found, 8 feet from where my head lay, the tracks of an immense Grizzly bear! It was obvious, I came from the snow-free highland, and did a beeline to me, following the scent trail. 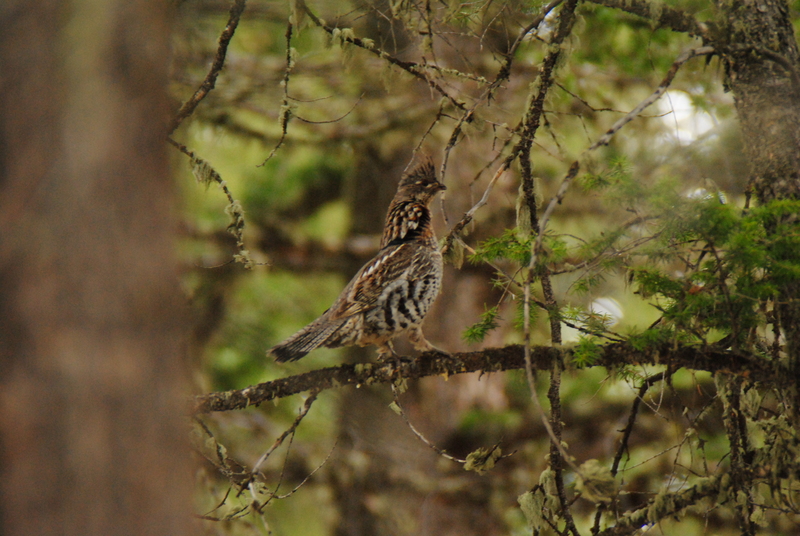 He must have seen my tent right when I shouted at him, upon which he turned and immediately ran away. I was humbled by the experience. An animal that- by all rights- should and could have swatted me into the after-live with one swift swing of his arms, merely turned and ambled away. It was an experience contrary to my impression, and many others, of the animals being unreasonably aggressive. At such close distance, I am amazed the bear did not attack me. More amazing, was the fact that he never even attempted to touch my food, even though it lay only 100 yards away. Deciding how lucky I was to experience such a close encounter with the great beast, without any incident, I decided it wise to leave his woods, and not chance another close encounter. On the way down, I met two hikers, and told them about my experience, and to keep an eye out on any Grizzlies in the area. If nothing else exciting happens during my last two days of road tripping, I will still be satisfied by that one encounter with the great Montana Grizzly bear.